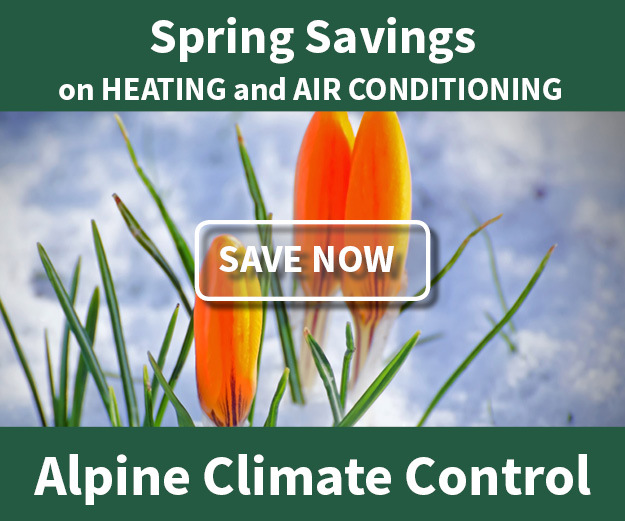 Equipment Basics - Alpine Climate Control, Inc. Many advancements have been made in the design of heating and cooling equipment that make them more energy efficient, reliable, quieter and provide more even temperatures. We specialize in Lennox products and we offer a complete line for both home and business. Below is a description of key available features and some basic terminology that you may need to know when searching for the right Lennox product. The Annualized Fuel Utilization Efficiency is a standardized measure of the heating efficiency of a gas furnace. It is expressed as a percentage. The higher the percentage, the more efficient the furnace. Gas furnaces burn natural gas or propane (LP). If your furnace has a pilot light that burns all the time it is no better than a 65% AFUE. If it has electronic ignition (no pilot light) and a metal flue it is 80% AFUE. If it has electronic ignition and a plastic PVC flue it is 90% AFUE or better. A 90% AFUE furnace transfers 90% of the heating value of the gas that is burned into your home for heating. The other 10% is the heat that is lost up the chimney. Traditional furnaces have one capacity, full blast. They are single stage furnaces. We size furnaces to be able to warm your home to 70 degrees when it is 20 below outside. Since most of the year is much milder than this, it doesn’t take the furnace long to reach the set-point on the thermostat in milder weather. Two Stage furnaces have two heating capacities, first stage and second stage. Second stage is full blast; first stage is about 60% of that. The furnace initially fires in first stage and only goes to second if it can’t satisfy the thermostat. This provides longer run times at a lower firing rate. This in turn provides for more even temperatures and more efficient operation. The Lennox SLP98 furnace features fully modulating heating. This will vary the heating output in 1% increments from 40% of its capacity to 100% based on the temperatures outside. This does a better job than a two-stage unit of providing even longer run times at a lower firing rate. Again, this provides for more even temperatures and more efficient operation. Pair the SLP98 with the iComfort thermostat and it can vary heat output and airflow in increments as small as 1%, or larger as needed, to minimize temperature swings and provide consistent comfort. Traditionally, furnaces have included multi-speed blowers. One speed is set by the technician for heating operation, usually medium and high is typically set for cooling operation. Variable speed blowers use advanced motors that work in conjunction with a control board to vary the speed. You will notice three differences in their operation. 1. When the furnace starts-up they are much quieter as they ramp up the speed gradually. 2. They use less electricity to operate and are ideal for improving indoor air quality by running the fan continuously. 3. The Lennox variable speed blowers are programmed to deliver specific amounts of air movement. These motors will work harder over time as the filter loads-up so they continue to deliver the air required. Finally, they are a great choice for zoning applications. When teamed with a Lennox Harmony zone control, the variable speed blower will deliver the proper amount of air depending on which zone or zones are calling. A bugaboo of many early high efficiency furnaces was that the igniter would fail every year or two. Lennox began using silicon nitrate igniters back in 2000 with tremendous success. These igniters just haven’t failed. Combustion air is the air used by the furnace to burn the gas, it will go out the flue. Adequate combustion air is required for proper venting of the gas to the outdoors. This is the room air returned by the duct work to the furnace to be heated or cooled so it can be redistributed out the supply ducts into the home. Inadequately sized return air is a common problem, it hurts cooling performance and can shorten the life of a furnace. This is the chamber where the fuel is burned and the heat is transferred to the air. A cracked heat exchanger can allow carbon monoxide to enter the home, which is a serious health risk and can cause death. Electric furnaces do not have a flue and transfer 100% of the heating value into the home. Although they are 100% efficient, the cost of the energy varies. See our Heating Cost Comparison to compare different fuels and heating equipment. Seasonal Energy Efficiency Ratio is a standardized measure of the cooling efficiency of an air conditioner. The higher the SEER number the more efficiently the air conditioner will cool your home. Several years ago the government implemented a higher minimum efficiency of 13 SEER for manufacturers. While systems are available that achieve over 20 SEER, our cooling season is so short that these systems won’t cost justify themselves on energy saving alone. Air source heat pumps work just like air conditioners with one big exception; they can cool and heat the home. To heat the home they run in reverse of air conditioning and transfer heat from the air outside into the home. In our region, air source heat pumps typically can heat the home until the outdoor temperature falls below freezing. Traditionally, air source heat pumps have been teamed with electric heating elements to kick in more heat as needed. The heat pump and electric heat elements will run at the same time in cold temperatures. The Heating Seasonal Performance Factor is a standardized measure of the heating efficiency of a heat pump. The higher the HSPF number the more efficiently the heat pump will heat your home. Hybrid heating systems team a heat pump, which operates on electricity with a gas furnace. By using the best of both, operating costs are reduced. New thermostats have been developed that incorporate an outdoor temperature sensor and will automatically switch between the heat pump and the gas furnace. The heat pump and gas furnace will not both heat at the same time, it’s one or the other. Beginning in 2010 all residential air conditioners and heat pumps manufactured use environmentally friendly refrigerant. This is good for the future of our environment, but it poses challenges for repairing old systems. The old refrigerant R22 cannot be mixed with the new refrigerant. The new refrigerant operates at much higher pressures and uses different metering devices for the refrigerant. So when old R22 systems fail, most of the time it will make the most sense to replace the indoor evaporator, metering devise and the outdoor condenser. Manufacturing of R22 refrigerant will be discontinued in 2020, so the prices are rising. In our country, hail happens. Louvered doors that wrap around the unit will protect the delicate copper or aluminum fins from damage. If your outdoor condenser sits on your back patio or outside your bedroom window you might be interested in units that feature noise reduction. • Compressors are made quieter by wrapping them in blankets or better yet enclosing them in insulated compartments. • Air noise is reduced with “stealth” fan blades and aerodynamic grill work on top of the unit. Similar to two stage gas valves, these compressors will run at two different capacities to provide longer run times, more even temperatures and more efficient operation. These compressors vary capacity in many small increments providing more even temperatures, better efficiency, and quieter operations.